Are you happy now, hipsters? Instead of walking away from your fashionable fad at its peak hipness, you’ve let it linger long enough to become a consumer commodity. Not only is Urban Outfitters thriving, it’s now spawning unholy consumer electronics like this cassette-playing turntable. It’s easy to point the finger at ION Audio for a creation like this — and we do, at least in part — but Urban Outfitters deserves most of the blame for continuing to fan the hipster flames and creating genuine demand for a record player that also plays another medium we were all pretty certain was dead. 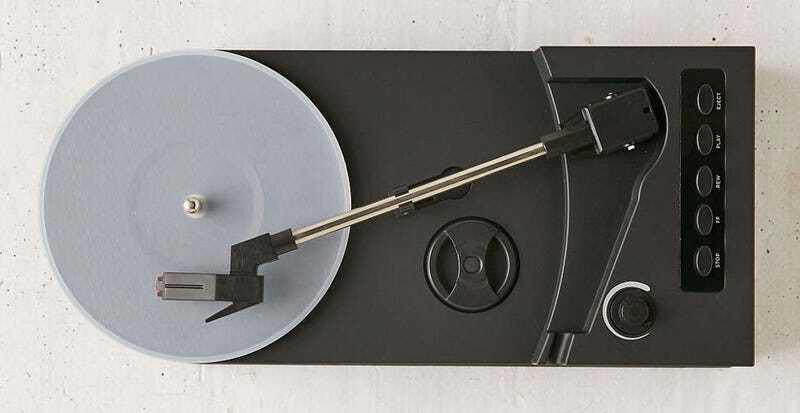 Urban Outfitters positions the portable device (powered by four AA batteries) as an easy way to convert classic vinyl and forgotten audio cassettes to MP3 files through iTunes. But that’s complete BS when elsewhere on its site it’s also selling albums on vinyl and cassette, and even blanks for making your own modern mix tapes (the cassette related products are yet to reach UK Urban Outfitters but, let's face it, it's only a matter of time).